In a Senate lunch, the president was focused on a state where he remains very popular. WASHINGTON — When President Donald Trump spent an hour with Senate Republicans over lunch in the Capitol on Tuesday, he talked about the party's legislative and foreign policy accomplishments as well as their future policy agenda. According to senators in the room, the president also spent a good chunk of time talking about the GOP's prospects in the midterm elections, with an almost singular focus on one state — West Virginia, where he predicted victory in November. For sure, Republicans have a good shot at winning back a Senate seat from Democrats in the state, but political handicappers think that Missouri, North Dakota, Indiana and maybe even Florida are as good or even better opportunities to gain seats. So why is Trump focused on West Virginia? “He’s popular there. That was the message,” Sen. Jeff Flake, R-Ariz., said. Trump does remain popular in West Virginia, where he won 69 percent of the vote in 2016, a larger margin than any other state. Other than Ohio and Pennsylvania (and Florida and New Jersey, where he often travels to his properties in Mar-a-Lago or Bedminster) West Virginia is one of Trump's most commonly visited states as president. Trump likes the state so much, he joked with senators during the lunch, that he might move there after the presidency. Trump may have noticed a new poll in the state that put Democratic Sen. Joe Manchin down by 2 points against state Attorney General Patrick Morrissey, who just became the GOP nominee last week. A previous poll, in August of last year, had Manchin up for 14 points. “According to the information from yesterday, there was a 17-point drop in the popularity of the incumbent there,” Sen. Tim Scott, R-S.C., said. Manchin said that Trump is wrong about what will unfold in the Mountaineer State this fall. Manchin has been saddling up to the president. He has voted for most of Trump’s political nominees and just last week he gave a glowing assessment of Gina Haspel, the contentious nominee to lead the CIA. Manchin, a former governor of the state, has voted with president 61 percent of the time in all, according to an analysis by FiveThirtyEight. West Virginia just completed a brutal Republican Senate primary where Trump is likely feeling vindicated. After a series of candidates in other races lost despite Trump’s endorsement, his participation in West Virginia may have helped the GOP field a good Senate candidate. 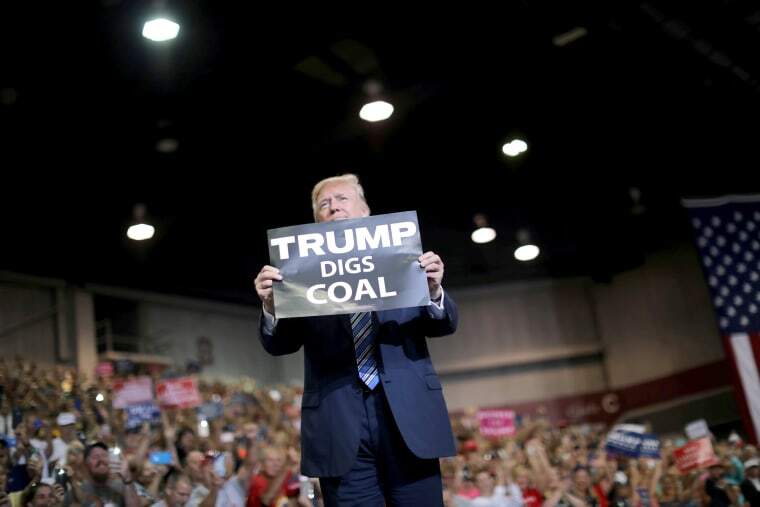 The president urged West Virginia voters to support either Morrissey or another establishment candidate over ex-coal baron and convicted felon Dan Blankenship, who was running a Trump-like campaign. Blankenship himself said Trump's actions may have contributed to his loss. Manchin has not spent any money in the race yet (although the Democratic super PAC Senate Majority Fund has run ads supporting him), while Republicans have spent $300,000 in the state. Still, control of the Senate could rest on the outcome in West Virginia, ensuring that the state is going to be hotly contested by both sides. Manchin insists, however, that he and Trump are on the same team. “This is not a team sport. This is team America. And I think at the end of the day he’s on the same team as I am: Team America,” Manchin said.